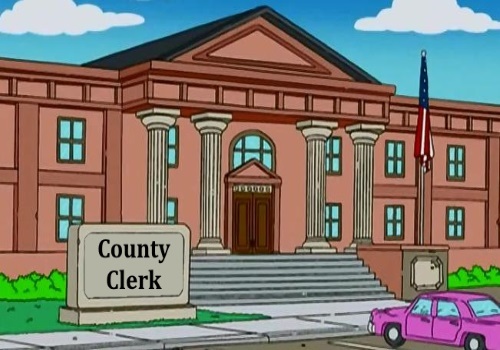 If you want to go to the county clerks office to obtain your marriage license, pick up copies or any other reason below are the County Clerk locations and information for the Southern California area. Call and confirm the information before you go to the County as their information, prices and hours change often. NORWALK: 12400 Imperial Highway Norwalk (562) 462-2137 Hrs: 8:00 a.m. - 4:00 p.m.
BEVERLY HILLS: 9355 Burton Way, 1st Floor Beverly Hills (310) 288-1261 Hrs: 8:30 a.m. - 3:00 p.m.
LANCASTER: 44509 16th Street West, Suite 101 Lancaster (661) 945-6446 Hrs: 8:30 a.m. - 4:30 p.m.
LAX AREA: 11701 S. La Cienega Blvd, 6th Floor LAX Courthouse (310) 727-6142 Hrs: 8:30 a.m. - 3:00 p.m. DOWNTOWN: 4716 East Cesar Chavez Avenue Los Angeles (323) 260-2991 Hrs: 8:30 a.m. - 3:00 p.m.
COMPTON: 7807 S. Compton Avenue, Room 215 Los Angeles (323) 586-6192 Hrs: 8:30 a.m. - 3:00 p.m.
VAN NUYS: 14340 West Sylvan Street Van Nuys (818) 374-7176 Hrs: 8:30 a.m. - 3:00 p.m.
Old County Courthouse at 211 West Santa Ana Boulevard in Room 201. It is the large red brick building. Hours: 8:00 a.m. to 4:30 p.m., Monday through Friday, except on holidays. 2:00 pm – 4:00 pm. Jerry Lewis High Desert Government Center Office 15900 Smoke Tree Street Hesperia, CA 92345 (760) 995-8065 appointments are required on Mondays and Fridays only; Walk-ins are welcome Tuesday through Thursday from 8:00 am – 11:00 am and 2:00 pm – 3:30 pm. Joshua Tree Office 63665 29 Palms Highway-1st Floor Joshua Tree, CA 92252 (760) 995-8065 is open on Tuesdays and Thursdays only with required appointments from 10:00 am – 12:00 pm and 1:00 pm – 2:30 pm. Marriage Licenses may be obtained 8:00am to 4:00pm Monday through Friday. Appointments are highly recommended. Please call (805)524-3701 for additional information.